Canadian dance company Ballet British Columbia comes to Birmingham this month on its first UK tour. 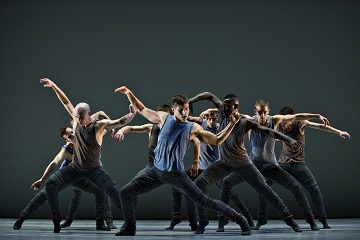 One of Canada's leading contemporary dance companies, Ballet BC will perform a triple bill of works all created by female choreographers - Ballet BC artistic director Emily Molnar's 16plus a room, Canadian dancer and choreographer Crystal Pite's Solo Echo and Israeli choreographer Sharon Eyal's Bill. Emily Molnar, a former principal dancer, took over the helm of Ballet BC in 2009 and since then the Vancouver-based company has become one of Canada's most sought-after contemporary dance companies. And so the time seemed ripe for a full tour of the UK. The company's British debut was performing at International Dance Festival Birmingham 2016 and, having tested out the British market, Ballet BC is now ready for a full UK tour. Presented by Dance Consortium, a group of 19 UK venues committed to showcasing international dance, the tour this March takes in London's Sadler's Wells, Brighton Dome, Newcastle Theatre Royal, Birmingham Hippodrome, The Lowry in Salford and Bradford's Alhambra Theatre. Emily says: "The programme offers a variety of voices from the contemporary dance world. We have work by two Canadian choreographers and one international. It's very important to us that we have a global conversation. Crystal and Sharon are both very prominent voices right now in international dance and we are really pleased to be able to showcase their work to international audiences." Emily's 16plus a room is inspired by the work of writers Virginia Woolf, Jeanette Winterson and Emily Dickinson and explores time, transition and stillness through movement. Solo Echo looks at acceptance and loss and is inspired by two sonatas for cello and piano by Brahms and the Mark Strand poem Lines for Winter. Bill offers the dancers the chance to showcase their skills in a series of synchronized ensemble pieces and solos. Emily is ambitious for the future of Ballet BC and is hopeful this UK tour will open doors for the company. She says: "I hope this UK tour will create other opportunities for touring across Europe. We want to continue to develop our audiences around the world. The company will have a future by building audiences around the world." Ballet BC performs its triple bill at Birmingham Hippodrome Theatre on March 16-17.